Today, I started working on the storage totes of homeschool supplies. What a task this will be! A few years ago, I had purchased a heavy wire shelving unit to hold the 18 gallon totes as well as other homeschool materials. This afternoon, I finally got a chance to start making space for the new curriculum. My organizational method for homeschool supplies is pretty basic. Here is a quick description of how I store everything. Art Tote – this is a 10 gallon tote that holds any art/craft supplies that are not used on a regular basis. This includes things like air-dry clay, chenille stems, beads, ribbon, feathers, construction paper, and much more. File Folder Games tote – a large Sterilite “show-offs” file tote in which I place any file folders games that I have put together for Pookie. I categorize them by subject to make them easier to find when needed. Pookie’s Curriculum – For curriculum, I use a large plastic tote typically used for hanging file storage. It is about the same size as an 18-gallon tote. In this, I store lapbooks and unit studies that are printed and ready to use, extra practice workbooks, and a file for the activities in the Letter of the Week curriculum he will be using. Little Miss’ Curriculum – Her materials are also kept in the same type of tote as Pookie’s curriculum. For her, the tote holds not only the workbooks, but unit studies and teacher’s manuals. The top shelf of the unit has smaller, flat locking totes to store general office supplies. I have these sorted by category. For example, one contains items that are only used occasionally such as brads, binding rings, and circle punches. I also have a comb binding machine that is stored on the shelf as it is used at least once every couple of weeks. A small 3-drawer container holds extra pens, pencils, and such that I use on a daily basis. I have plans to add a couple of shelving units to the homeschool area as soon as we are able to. One will be a 9-cubby unit to be used as Pookie’s workboxes. I love the idea of how Montessori uses the cubbies with trays or baskets holding the individual activities. This may make it easier on Pookie to transition from one to the next. For him, if something is out of his sight, then he doesn’t look for it. So, having his activities in the drawers/workboxes didn’t work too well overall. This method should, in theory, work far better with him. The second shelving unit will be one of those tall narrow ones that looks like a series of cubbies stacked into a column. This will make a great place to store notebooking binders and readers that Little Miss will need regularly. Pookie will have a shelf for storing a few extra supplies as well. For him, there will be favorite books that he enjoys looking through or puzzles. Additional shelves will be used for storing their pattern blocks, cuisenaire rods, and other manipulatives that are used throughout the term. The 10-drawer unit that was set up this past term for Pookie’s workboxes will be turned into a supply cart for the most often used school and art supplies. This will make it far more convenient for Little Miss as well. As any homeschooling family can tell you, it takes time to find what works best for your family. Whether it be curriculum, teaching methods, or organization techniques, it all is a process of evolving. What works for a while, may need to be tweaked as the kids get older or circumstances change. It is a fun journey of discovery on all levels. With our school term approaching its end in a couple of months, I am starting to go through all of our homeschool books and supplies. Our homeschool convention is typically held the end of April and I am planning on buying new curriculum and supplies for the upcoming new term. I cannot even consider buying anything though until I have purged the no longer needed items from our shelves. I know that to some homeschool families, that is akin to blasphemy to say you are getting rid of anything homeschool related. Alas, when living in a small home, you have little choice in the matter. As many homeschoolers can attest to, the shelves can become quite overflowing in a very short time. I started with one bookcase today and have bagged up 2 large paper grocery bags of books to be donated elsewhere. There are still 2 more bookcases to go. The smaller of the two is stocked with children’s books that Little Miss has outgrown and Pookie has no interest in. I am going to be weeding through that one very soon. The fact is, the curriculum that Little Miss uses comes complete with any readers needed for the school term. She is also very keen on getting her own Kindle Paperwhite. With that, her book collection will greatly increase without needing extra storage. She will still be keeping the books she loved the most, but there are many that she has simply outgrown. Pookie likes to look at books with lots of colorful pictures, but is more picky about it. There are some that he loves to look through and those will be kept. Almost all the remaining books will be donated. In the area of curriculum, there are materials that I have purchased and used for Little Miss that are still in like new condition. I made sure that the teacher’s guides and readers were kept in great shape so that I could sell them when we were finished. The money that we get from selling these materials will help cover the cost of buying new curricula for the kids. As I go through the materials and supplies, I am taking note of inventory. I have the list of what was purchased last year and am comparing it to what is still left over. This will help me greatly when I go shopping this year. I can preplan the purchases and take advantage of sales as they come along. I am debating on whether I will purchase curriculum at the convention or not. Last year, I was very disappointed to discover that many of the vendors did not bring product, but samples only. If you wanted to buy from them, you had to place an order. I am someone who likes to receive the purchase right away. So, I am going to find out from the convention sponsors if they know what the vendors will be doing. If I have to order the materials, then I may as well do it early and avoid the delays caused by the convention schedules. When I go to the convention, my purchases would then be focused upon the “extras” needed to round out the lessons. By far, the shelving that needs the most attention is Pookie’s OT shelves. I have a shelving unit just for storing the various OT therapy activities for him. These are things that mirror the activities he does during his weekly occupational therapy sessions. I am going to be adding more activities to the shelves, as well as possible another shelving unit. The activities are stored in containers according to the activity. For example, I placed all the wooden lacing beads in a container along with several items to string the beads onto. In this case, a wooden dowel with a wooden wheel glued on one end to act as a stopper, a length of clear plastic tubing, a pipe cleaner, and finally a shoelace. I am converting a 10-drawer caddy into a basic supplies storage. Each drawer will contain a different type of supply. The hope is that this will make it easier to locate what we need easily. I especially like that Little Miss will be able to be a bit more independent in this area. It will also cut down on what she has to store in her 4-drawer storage tote. If what I have already sorted out is an indicator, I will be cutting out supplies down by nearly 2/3’s of what we had. It feels great. Now that the New Year’s holiday has passed, it is time again for people in the US to begin thinking about tax season. How can this be important enough to post on a homeschool and autism blog? Easily! You see, we fall into the tax bracket that allows us to take a $1000 tax credit for each of our two minor children. It also means it is time to start planning the purchases needed for next year’s curriculum. My husband and I both feel that since we receive that credit due to having the kids, then that amount of the tax refund we receive should go towards their homeschooling. This gives me a $1000 to spend per child. On average, the curriculum for each child can cost about $500 when I include all the consumables and readers that go along with their curriculum. The balance of the money is spent on other school related items. I begin by evaluating the curriculum that we have been using. Was it effective? Were there any concerns? Did it cover as much information as it should have or was it weak in some areas? All of this is taken into consideration. If there are any true concerns, I then start the process of finding something that will be a better fit. As a part of this process, I take into account our children’s strengths and weaknesses. What learning style do they respond to the best? How can I use their natural talents and interests to help enhance their learning experience? This year, I had to face a truth that I was not really wanting to. Even though I would love to have both Little Miss and Pookie using the same publisher’s materials for the homeschooling, it just isn’t a good fit for them. Little Miss and Pookie both thrive on hands-on activities in their education, but Pookie is far behind Little Miss when it comes to what he is able to do. For Pookie, he needs and thrives on two things, Montessori approach and lapbooks. He absolutely needs the hands-on activities to learn. If it requires writing, then he cannot do it at this time. He still lacks sufficient fine motor control to write. He is capable of showing knowledge in others ways however. That is where we focus at home. Pookie also loves to look through books. With that in mind, I have tried lapbooks with him. He is receptive to it and likes to look through them later on. For Pookie, we will be continuing the Letter of the Week curriculum written by Erica of Confessions of a Homeschooler. This has been a blessing to have for Pookie. I purchased the download version of the curriculum and love it. The activities are brightly colored and get his attention. I print out the pages needed and laminate any puzzle or game pieces. If a page is for drawing or writing on, I put it in a sheet protector to make a dry-erase page. Some pages, like the do-a-dot activities, I print several copies since they are a fun activity as well as being good OT style activity in developing hand/eye coordination. Pookie’s lapbooks are from free resources on Homeschool Share and also some purchased ones by Knowledge Box Central. Both are excellent resources. I am currently choosing lapbooks that match readers that we have. These help to reinforce what he learns. One item that I love to include is sequence cards or pictures to help him to recall the order in which things happened. For now, I use them to retell a story, but eventually he will be able to put them in order on his own. The Montessori activities that i use for Pookie come from a couple of resources. First, his OT therapist, Miss Amanda, is always a great sounding board for me to use in coming up with ideas. I also pay close attention to what she does with Pookie at his sessions and try to incorporate those activities into his homeschooling. The second resource in Pinterest. A search for “Montessori preschool” gives you a wonderful selection of activities and websites that provide free activities to print out. There are also websites which sell Montessori style activities as well. For Little Miss, we will be returning to the My Father’s World curriculum. She will be starting the Exploring Countries and Cultures program. This program has a lot of hands-on activities to nurture her love of that style of learning as well as just enough writing to fulfill those goals. She loves to read, so any reading required is never an issue. She is really excited to start learning about other countries. It is a great overview to prepare her for the subsequent four years in which she will be having a world history focusing on 4 time periods. Each time period will be a curricular year long study. The time periods are: Creation to the Greeks, Rome to the Reformation, Exploration to 1850, and finally, 1850 to Modern Times. At the end of those years, she will repeat the Exploring Countries and Cultures on a deeper level in 8th grade before starting her high school courses the following term. For Math and Language arts, both of which are courses not included in the ECC program, she will be using Christian Light Publishers materials. After using Singapore for the past two years, I am liking what I have seen of the math program that Christian Light makes available. Their language arts program is also a very sound one that will serve her well. Once we purchase the curriculum materials for the kids, there is always funds left over. I use the surplus to purchase a year’s supply of art supplies, paper, pencils, glue, scissors, and any other basic school supplies that they will need in the upcoming school year. By the time I am finished, I always have fully stocked supply bin and don’t have to buy anything else for the entire school year. I generally will take an inventory of the supplies on hand that are unused from the previous year. Then, once I have purchased the curriculum, I look through the lessons to see what art supplies or other extras will be needed for the hands-on activities and lessons. Using this information, I plan out my shopping list for the basic school supplies and extras needed. This is a tremendous help to us later on during the school term. I don’t have to rush out to buy something last minute. Once those items are purchased, I use the remaining funds to purchase family season passes for places like the zoo or children’s museums within reasonable driving distance that will be fun for to take the kids to on multiple visits. The pre-planning is always a help when this time of year comes along. I already have my purchases planned out before homeschool conventions begin. At convention, I am often able to purchase materials at a discount. As soon as stores start their back to school sales, I am ready to shop and make the most of it. This takes a lot of the stress off since we don’t have to worry about how we will be able to purchase everything. Maybe it is an idea that will help others who homeschool as well. I wanted to touch on an idea that I am using with my family. Those of us with a special needs child knows that there are often items that our children need that are out of the ordinary. Maybe it is a therapy related item or a toy that can help with building a skill that your child is needing to be improved upon. Let me share with you an idea that I have been using with our kids. Amazon has a great wish list feature that you can customize. You can create as many wish lists as you want, each having it’s own privacy setting. You can make the lists private for your viewing only, public, or view-able only by those whom you give the direct link to. This year, I set up a wish list for each of our children. Pookie’s wish list contains toys that are not only ones that interest him, but also are skill building. These are often based upon the activities that he does with his therapists are the therapy center. Often, a family member may not know what to get your special needs child. Toys and such that are the typical age appropriate choice for a child without a disability are not always the right choice for a child with special needs or developmental delays. That is where the wish lists come in handy. Once set up, you can share the link with family members who ask for gift ideas. Then, they can either make note of the items listed, or they can make the purchase through Amazon. This idea isn’t only beneficial for special needs children. Little Miss has her own wish list as well. Her list contains the things that she is interested in. Like with Pookie, the link to her list can be shared with family who are looking for ideas. These wish lists are also a help for me. Once the lists are created, I am able to go to the lists and choose items as we have money for them. I don’t have to use the search feature to find the gift ideas. They are already organized and ready for me. If you homeschool, you can set up a list for homeschool related items that your children need as well. There are no limits to how you can use the wish lists. For family who live a distance away, the lists can be especially helpful. It is an idea that works for us. Maybe it can help others as well. Recently, I was asked why we use the workbox system for our homeschool. It is a question that I have been asked often enough that I feel the need to blog about this. When I first was introduced to the workbox system, it was through Robin’s blog on Heart of Wisdom’s website. Being that I prefer things to be very organized, I gravitated to the various blogs on Robin’s links page. I was surprised to see just how varied the families chose to implement the system in their homes. Little Miss was a preschooler at the time. Even at that age, she was very self-driven. If I had all her activities laid out for her, she would go through them independently. The thought of organizing them onto a bookcase appealed to me. We were given a couple of old school desks for the kids by a neighbor. I set one up next to a bookcase and loaded it up with the shoe box bins as suggested in the book, Sue Patrick’s Workbox System: A User’s Guide. For Little Miss, this worked out great. For me, not so much. I love books and I tend to get a bit cranky when I find damaged ones. Seeing the workbooks develop a curl in them from being in the shoe box started to grate on my nerves a bit. I ended up tearing the pages out of her workbooks, which wouldn’t have been my first choice, but the workbooks were not all curled up. Using the system with Little Miss was a great learning curve for me. I will always be grateful that I learned about the system long before I began homeschooling Pookie. With Pookie, the system has been a life saver. Autistic children tend to crave a strict routine in order to function well. This is especially true when it comes to educating them. In order for Pookie to be able to focus on his homeschooling, he needs the routine to be a constant that he can count on. If I decide to mix it up a bit, he doesn’t always respond well. This does not mean that he has to do all activities in a specific order. It only refers to the idea of using the workboxes only part of the time. If I have him using the workboxes and suddenly stop using them for a few days, he doesn’t tolerate it as well. He finds it harder to focus on the activities he is doing. I believe that he needs the consistency of using the workboxes to stay on track. While the activities in each workbox may change from day to day, there is a consistency in the fact that his work is always stored in the workboxes. As he works through his visual schedule and completes the activities as outlined on that schedule, he is able to manage ti without a meltdown. Many families without an autistic child use the system successfully with their children. It provides a means to teach kids how to manage their time and have self-discipline. On the various blogs out there, you can often find cute printable workbox number tags and cards for the visual schedule that you can print for free. These are really cute and you can make them in any theme you want. You can print out themed tags and cards that appeal to each of your children. This can make workboxes fun for little ones. For Pookie, I found that the cute factor doesn’t help him any. He can become distracted by the pictures on the tags and schedule cards. His cards are pretty generic. The workbox tags are plain numbers with no pictures. Where we do use graphics is in the visual schedule. Intermingled with his number cards, he has little cards with pictures of his various therapy toys and manipulatives. For example, I made cards with pictures of his pattern blocks, sort & stack set, lacing beads, and puzzles. The number cards on his schedule are a duplicate set that match his workbox tags. There are several aspects of the system that I especially see as being beneficial to Pookie. First is the visual schedule. The schedule is one of the foundational elements for Pookie. It allows him to not only know what is coming up, but he can have a certain level of independence. He takes each activity in sequence and is able to move through his daily assignments. All the while, he is able to visually see that there is a stopping point. Adding the check in/check out card also gives that sense of knowing when his school time starts and stops. Next, I look at the “work with Mom” cards. These little gems are a great way to let the kids know when they need to come to me for further instruction or aid in an assignment. At this point, most of Pookie’s workboxes are requiring my help. Gradually, the level of assistance has been dropping. I help him set up the activity and get started, With certain activities, he has been doing them long enough that I am able to step back and he will continue on his own to complete it. With Little Miss, these cards let her know when I am needing to give her more information or discuss a new concept. Once the instruction is done, she works on her own to complete the assignment. The “Help” cards that I give to Little Miss are a great motivator in teaching independence. These cards are used for those times when your child is capable of doing the assignments on their own, but they want you to help them instead of figuring things out for themselves. One good example of this is a behavior that Little Miss had a couple of years ago. She was capable to doing her worksheet on her own. The instructions on the worksheet were very clearly written at her level of understanding. She kept coming up to me to ask what to do each step along the way. When I would ask her what the instructions said, she could tell me clearly what she was to do. She just wanted me to tell her instead of her reading the instructions for herself. In situations like this, the Help cards are terrific. Given 4 of the cards at the beginning of the school day, she learned quickly to do as much work on her own as possible. Each time that she comes to me for help (excluding when there is a Work with Mom card along with her assignment), she has to give me one of her Help cards. When she runs out of Help cards, she can no longer ask me for help. She quickly learned to save those cards for when she truly needed the assistance. One of the ideas in the system that Pookie’s Occupational Therapist, loves is the extra cards for the child’s desk. Having an “I’m ready to work” and “Quiet” card in a little stand on the desk are valuable tools. They are visual reminders to the child of what they should be doing. It is also good non-verbal way to address the issue of a child non focusing on their work. The example in the book mentioned that if a child zones out, you can tap or draw attention to the “I’m ready to work” card and help them to refocus without having to give verbal instruction. In a classroom setting where there are other children present, this can be very important. In the homeschool setting, if you have one child who is distracted when you are speaking to another child, the non-verbal approach is also a benefit. So, how does all of this translate into our homeschooling? I made for each of the kids a picture card. It is an index card with their photo on it. After breakfast, they take their card and place it into a “School’s In” pocket I have set up for them on a wall chart. They then go to their work stations and begin going through their visual schedules. On the schedules, there are workbox number cards as well as a few activity cards that are ones done away from the desk. I also have 2 snacks and a lunch card on their schedules as well. They work through their schedules until all of their homeschool assignments are finished. Lastly, they take their picture card and move it to the “School’s Out” pocket. One new card that I am making for each of the kids is a “clean work station” card to have as their last item on their visual schedule. This reminder will help to ensure that the area is cleaned and ready for the next day before they go off to play. Having the set routine, Little Miss is able to complete her work in a more timely manner. It wasn’t always the case, but as she learned to manage her time, she has improved on this considerably. A very helpful item for her has been the use of a kitchen timer. I am looking into buying a visual timer for them to use instead. There are some really nice ones that are like a traffic light. It starts with green, then as the time is nearly up, the yellow light comes on. When time is up, the red light comes on. This one is going to be a better option for Pookie as it is very visual and he will learn time management best with it. I know that many homeschool families are against the idea of using timers, but it is a personal choice. You have to look at what is best for your children. Ours happen to do better if they know that they have a time limit. Since using the workbox system, the school days have gone more smoothly for Little Miss. She gets more done each day and is now learning time management to the point that she can finish her school day earlier than she used to. For Pookie, the routine is calming to him. He is able to predict what comes next. This alone has been a way to reduce frustration and meltdowns. His focus on his activities and assignments is much better than before. With the increased focus, he is able to learn in a much more efficient way. I love to pre-plan my monthly menus. I find that this not only makes life easier for me on a daily basis, but it is a huge help in my food costs each month. One area that I always seem to forget is planning out our lunches. Each week, lunchtime is a meal that we just grab something from the pantry. Rarely have I planned ahead. I am making changes to that though. On Pinterest, I have become hooked at searching the kids’ Bento lunch ideas. Have you seen these cute meals that some parents put together? They are absolutely adorable! Now, our 8 year old daughter is giving all the expected girlie responses to the pictures. Our son, not so much. The basic ideas though are great. I went to Dollar Tree and found some 3-sectioned round plates with lids in their food storage container aisle. These are as large as a standard dinner plate and about 1 1/4” deep. I ended up buying 5 of them with plans to buy 5 more next time I am at the store. All I will need to make these a perfect option for packed lunches on our outings is to buy an insulated food bag like those found in grocery stores. The first form that I made is a simple one that is pretty generic for any Bento style container with 4 sections total. The form gives you ample room to record lunch ideas 5 days which include a main dish plus up to 3 sides. 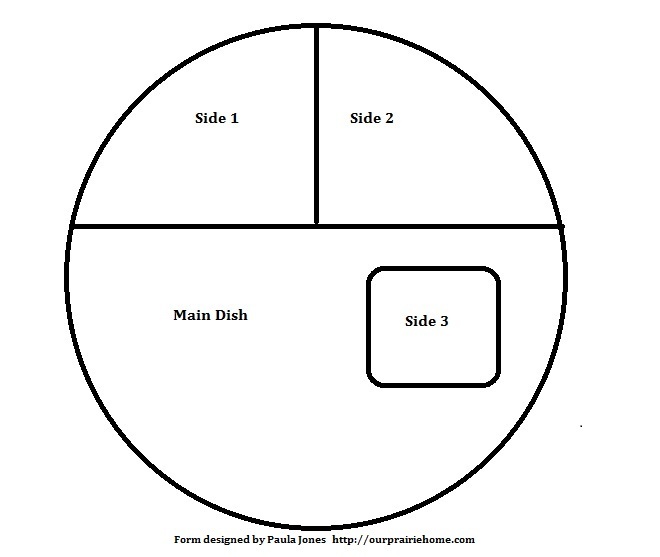 The second form is more of a chart with the plate graphic for each weekday. You can fill in the plates with the items you will be packing. The bottom portion of both forms includes a shopping list for recording what you will need for each week’s lunches. I love the idea of having the written planner for the lunches. Each week, I will be able to have a set plan that I can work from throughout the week. Even though we homeschool, I can still prepare the lunches the night before and have them ready to go the next day. When we have an outing, these pack and go lunches will be a huge benefit. We can continue to eat vegetarian foods in spite of a lack of vegetarian choices at the venues we go to. The packed lunches will also be healthier and cost less than eating out at a fast food or other restaurant. Just as with my weekly dinner menus, I will save the menus that I put together. This gives me a ready supply of ideas. Typically, when I use my weekly dinner plan sheets, I have a selection of 8 different weekly menus. When I plan m monthly grocery shopping, I choose 4 of the weekly menus and that will give me a month’s worth of meals. Each planner sheet contains a grocery list for that specific week’s menu. Having the lunch planner will make the shopping for lunches a lot easier. Just as with the dinner plans, I can see at a glance what groceries will be needed. When making out my shopping list, I combine the grocery lists from each planner form onto a single grocery list. You can download a free copy of the Lunch Menu Planner for your own use. I ask that you do not repost the link to the download to your blog or try to pass off my forms as your own. Please refer people back to this blog post to access the download if you want to share it.